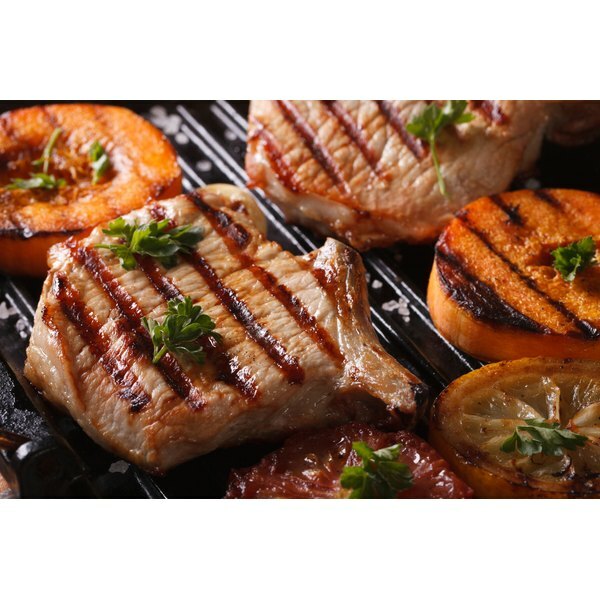 Pork steaks, more commonly known as chops, aren’t always high in calories. They range from approximately 125 to 220 calories for one serving. Lean and trimmed cuts from the loin have about half as many calories as fattier chops from the rib area. If you’re carefully counting calories, though, adding oil for cooking purposes can double the number of calories from your chop in some cases. Pork Steak has 207 Calories and 14.29 g of Protein per 100 gram serving according to the nutrition facts provided by the USDA Food Composition Database. A roasted pork tenderloin steak weighing 3 ounces gives you fewer than 125 calories. If you have a broiled blade chop, a 3-ounce boneless cut has around 145 calories, while the same amount of a boneless cooked top-loin chop has closer to 170 calories. Center-cut rib chops generally have the most calories -- over 220 per 3-ounce broiled chop. Consider using nonstick spray in place of oil during cooking to minimize calories. Just 1 tablespoon of oil can pack on another 125 calories, compared to nonstick spray, which only has a trace amount of calories. Can You Eat Eggs while on an Atkins Diet?